Tetryl, (2,4,6-Trinitrophenylmethylnitramine, C7H5N5O8) is a sensitive explosive compound used to make detonators and explosive booster charges. Tetryl is produced by slowly mixing dimethylaniline with concentrated nitric acid in the presence of sulfuric acid and due to its simple synthesis it is prone for attempted synthesis by terrorists. 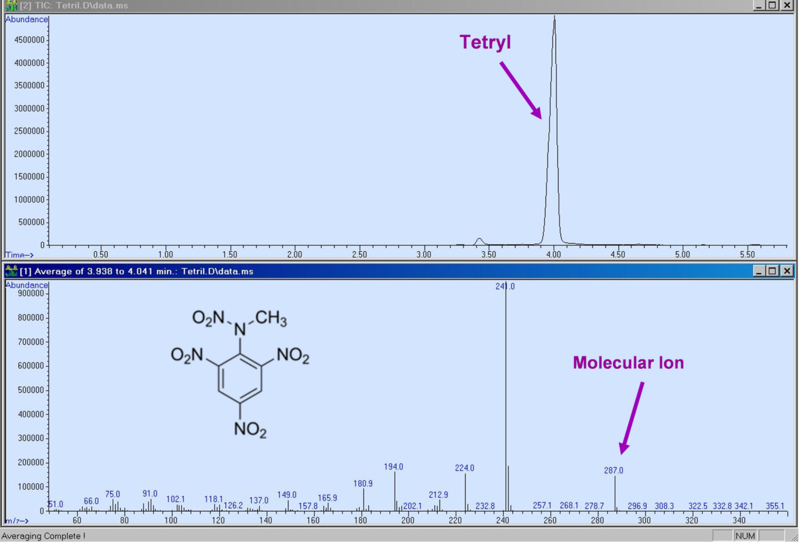 Tetryl is a thermally labile explosives that is known to be difficult to analyze by GC-MS due to its degradation at the GC injector and at the GC column to N-methylpicramide through a loss of NO and a gain of hydrogen from the column PDMS film. As a result, the analysis of Tetryl is challenging. We received a sample of Tetryl that was synthesized by A.I. Explosives, Inspection & Services Company (www.aiexplosives.com) that attempted to follow terrorist's synthetic roots and characterize it via the tetryl synthetic impurities. In this post we present the uniquely successful analysis of Tetryl perform with Aviv Analytical's 5975-SMB GC-MS.
As shown in the figure below tetryl was easily analyzed with the 5975-SMB GC-MS with cold EI and the analysis was fast with tetryl eluting at 4 minutes. The Cold EI mass spectrum was uniquely characterized by the availability of sizable (16%) relative abundance of the molecular ion at m/z=287 and without intra column degradation. Tetryl was identified with the NIST library with 86.8% identification probability and this identification was confirmed by the Tal-Aviv Molecule Identifier (TAMI) software based on isotope abundance analysis with a matching factor of 956 and a combined NIST-TAMI identification probability of 100%. In addition to the peak of tetryl itself we also found an earlier eluting peak at 3.42 min with a molecular ion of m/z=277 and same fragments as of tetryl thus assumed to be of tetryl with one less oxygen atom that was formed in the synthesis. This earlier eluting peak can serve for following the synthetic root. It is noted that the 5975-SMB GC-MS with Cold EI uniquely excels in the analysis of thermally labile compounds. In the current case of tetryl, the high column flow rate during the injection of 42 ml/min enabled the use of low injector temperature of 180ºC that eliminated injector degradation, while the high column flow rate of 16 ml/min in combination with the use of short (5 m) column lowered the tetryl elution temperature by more than 100ºC to 160ºC, and thus fully suppressed intra column degradation. In addition, the use of a fly-through ion source eliminated any sample degradation at the metallic surfaces of the ion source and the sample vibrational cooling in the supersonic molecular beam resulted in the provision of an enhanced molecular ion in the Cold EI-MS of tetryl. These observations above were regarded as amazing for A.I Explosives which observed such results only with the 5975-SMB GC-MS with Cold EI. System: 5975-SMB GC-MS with Cold EI system of Aviv Analytical, based on the combination of an Agilent 5975 MSD with the Aviv Analytical supersonic molecular beam interface and its unique fly-through ion source. Injection: 1 µL at 180ºC with pulsed split injection with split ratio 10 and injection column flow rate of 42 ml/min. Sample: about 500 ppm tetryl after its synthesis and first crude cleanup in acetone solvent. He column flow rate: 16 ml/min. Oven: 80ºC followed by 20ºC/min to 240ºC.